Treat your loved ones to this tasty Heart-Shaped Meatloaf recipe. 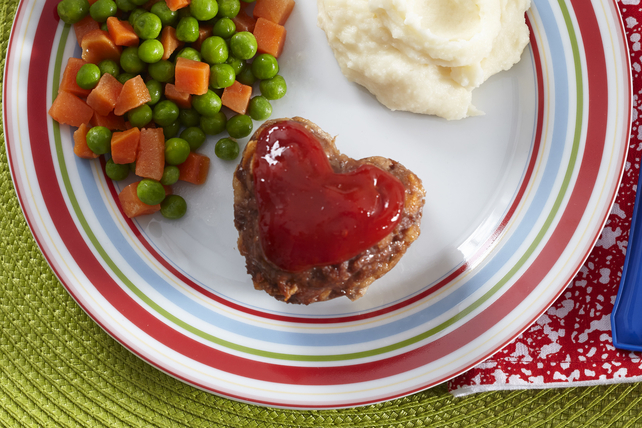 This adorable Heart-Shaped Meatloaf is super simple and totally scrumptious. Add milk to stuffing mix in large bowl; stir. Let stand 5 min. Add meat, egg and 1/4 cup ketchup; mix just until blended. Place 8 (2-inch) silicone heart-shaped molds on baking sheet; fill with meat mixture, adding about 1/2 cup meat mixture to each mold. Spread remaining ketchup evenly onto meat mixture in each mold. Bake 35 to 40 min. or until meatloaves are done (160°F). Cool 5 min. before removing meatloaves from molds to serve. For more nutritional info, CLICK HERE. And I’m pretty sure that those of you familiar with the Moonstruck series will have guessed Hannah for this one. Poor Hannah. She’s highly intelligent (numbers are her thing) and she’s a real Mama Bear…err…Wolf when it comes to her pack, but she can’t cook for squat. Still, she gave this one a try. Mac and Liam bravely ate what she splattered on their plates. Mac swore to Liam he’d take them out for dinner next year. 😉 If you haven’t already, the start of Hannah and Mac and Liam’s entrance into the world is there for the reading in MOONSTRUCK: SECRETS. This entry was posted in Books, Writing Life and tagged books, food, fun stuff, Moonstruck, reading, recipe, series, Tuesday Treats, writing. Bookmark the permalink. ROFL, I can totally see Hannah doing exactly that. Mac and Liam are better off taking her out to dinner for Valentine’s Day.